Bread of life. A memoir. I first received the bread on May 3, 1992, at the age of eight. The first person to give me the bread was Father Joe. Father Joe used to say to me: “We forget who we are. But God never forgets.” He would say this when he wanted me to consider the priesthood. In the beginning, I ate the bread in the church where I was baptized. Later, I ate the bread at liturgies in our high school gym, all vast and white and smelling like rubber and paint. I have eaten the bread under a tent in rainy darkness, with hundreds of other students from Jesuit colleges. It was spiritual food for the next morning, when we took up our white-painted crosses, which bore murdered people’s names and ages, and protested in front of the School of the Americas. I have never eaten the bread in my dad’s church. I am Catholic; they are Lutheran. It’s interesting watching everybody else in church do what you can’t. You feel fidgety. You’re sure they’re all looking at you. I have eaten the bread as wafers of varying sizes and crunchiness. In college, I ate it as actual home-baked bread, dark brown with a touch of honey. Later, it morphed into grayish tasteless rubber. Word on the street was that a busybody had reported our recipe to the cardinal’s office, which then banned it. I have eaten the bread at St. John Lateran, the pope’s cathedral. I noticed how Italian priests, or at least that Italian priest, did not say “the body of Christ” when giving you the bread. They just put it in your hand. And Italian people, or at least those Italian people, did not say “Amen.” They just took it. I bucked the Roman crowd. I said “Amen.” At this, the priest looked me in the eye, unblinking and expressionless, as if my irises would be useful in a lineup at the Vatican jail. I have received the bread from a cardinal, and I have received it from the bishop of Joliet, Illinois. I have received it from Gustavo Gutierrez, and I have received it from women priests. I have received it from a priest who was removed from ministry for abusing minors. I have received it from a priest who went to jail after embezzling some two hundred thousand dollars in parish funds. I have received it in a small, bright chapel in Washington, D.C., where our retreat group spoke the words and raised the vessels with no priest of any kind present. I have distributed the bread. I became a Eucharistic minister at college. I remember little of the training session, other than how our two facilitators (a friend and her soon-to-be-ex, who was also a soon-to-be-Jesuit) sent me home with a candle that had a Bible verse on it. I better remember how Len, our deacon, trained me for my parish. Len taught that when you give somebody Communion, you meet their eyes. And if you’re giving them the bread, you make sure your finger grazes their palm. Sacraments are contact. I have distributed the bread while flanked by Knights of Columbus, who stood guard in their full regalia of tuxedo, cape, and sword. I have given it to my mother, and to the local mayor. I have given the bread to the elderly couple, both pushing ninety, who ran the parish soup kitchen. I saw the body of Christ in them more than I did in whatever I was handing them. I have watched my grandmother grab my friend’s arm and drag him into my line, so he could receive from me. I have distributed the bread at my grandmother’s funeral. I have distributed the bread by accepting a wooden plate from the roommate on my right, taking my allotted portion of the contents, and then passing it to the roommate on my left. It was a living-room Mass, celebrated at a coffee table in front of a fireplace on a frozen white night. When it was over, we went tobogganing. I stopped distributing–and receiving–a few years ago, when I quit going to Mass. I found the messes of church and life overwhelming. I needed to get away so I could remember what I did and did not care about. But after a year and a half, in that little twilight between Benedict and Francis, I came back. 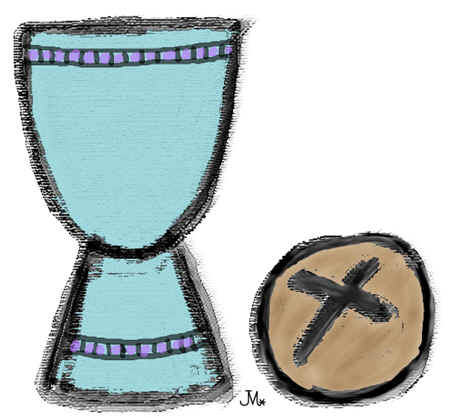 My return had much to do with the Eucharist, and with the kaleidoscope of memories of which it was a part: this constant thread, this radical invitation, this thing that makes me belong to other people and their stories. At my new parish, I only eat. I do not distribute. This entry was posted in Spirituality and tagged bread, Catholic Church, Catholic imagination, communion, Eucharist, sacraments, spirituality by Justin Sengstock. Bookmark the permalink. Thank you, Lacey. I’d add that with my dad’s church, it’s not really up to me. These are Missouri Synod Lutherans, who are a very strongly confessional denomination and keep a tight rein on this stuff. The pastor personally gives everyone Communion (elders might help him with the wine, but the pastor does all of the bread), and if you are not known to him as a member of the congregation, then he will not give it to you unless he questions you and determines that you are a Lutheran who believes the right things. Now, if this parish were UCC or Episcopalian and more chill about such things, then yes, at this point in my life I’d just go up and receive with everybody else.